Have you entered your child into our ‘One Day I Will…’ contest yet? If not, what are you waiting for? A $2,500 savings bond will be awarded to one 3-8 year old. Additionally, the lucky winner will have his or her entry turned into a Beautiful Futures tee to be sold worldwide. Wow! 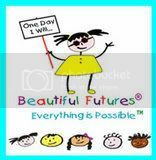 Visit BeautifulFutures.com today and learn more about who we are and what we do. Meet our Beautiful Futures kids and learn about our fund-raising and Mommy Rep programs. You’ll also see some of the amazing stores we’ve been sold in as well as some of the amazing press we’ve received. We’re a very special company. We love what we do and it shows!